While waiting for Fiddledaddy to finish an appointment, I found myself alone, and within a block or so of a Big Lots. I hang my frugal head in shame when I tell you that I’ve never step foot inside of a Big Lots store. Oh, I’ve perused the ads, and have made vague statements about the need to check it out some day. But our closest Big Lots is not very close at all. I was worried, because when faced with a store full of useless crap at bargain basement prices, I am likely to lose my mind. I found the last remaining shopping cart, and entered the glass double doors. Clearly marked “EXIT.” I reasoned that I needed a cart not for all the useless crap I was likely to fill it up with, but as a sort of “walker” which is needed in these days leading up to my knee surgery. I can justify most anything. I stealthily moved up and down each aisle, like a cat in search of elusive prey. I paused at the aisle which boasted of name brand drugstore items marked 50% off. Oh, Big Lots, you have my number. In fact, they carried a brand of Calgon lotion that Wal*Mart no longer carries. I threw 2 tubes into the cart. But then I paused, opened the lotion, sniffed, and put a bit on my arm. A little stinky. Okay. So I put one of the tubes back on the shelf. I walked a few more steps, smelled of my arm again, and realized that a tube of this stuff would be a grave error. Made worse because of my frugal makeup, in that no matter how foul smelling it was, I would be hell bent on using it UNTIL THE TUBE WAS COMPLETELY VOID OF LOTION. I’ve been down that aisle before. My cart was again empty. The toy aisle didn’t lure me to toss anything in the basket. I scoffed at the prices. I moved on to toilet paper, then food items. I get a better deal at Wal*Mart. 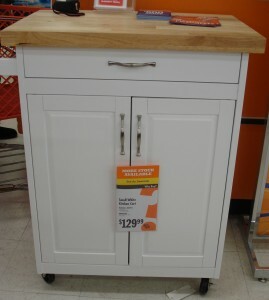 The only single item in the entire store that I considered snapping up, was a white kitchen utility cart with a butcher block top and storage underneath. To the tune of $129.99. It was the perfect size for my postage stamp kitchen. But Fiddledaddy and I have an agreement that we don’t spend over $100 for anything without written and expressed consent. And a pinky swear to get rid of something in its place. So I took a picture to make my case later in the day. Photographic evidence works so much better than me trying to describe something with wild gestures and a high pitched voice. It’s a great height, and would totally take the place of the bar stool that I drag across the kitchen when I need extra work space. I had been coveting one I saw at Sears a year or so ago for over $200. What do you think? Go back and snap it up? Or look for one at a garage sale for SO MUCH LESS MONEY? In the end, I parked the cart at the front of the store and left empty handed. Big Lots, you disappointed me. OR. May, just maybe, I’ve sprouted some will power and am able to resist all the useless crap that before would lure me as I walked down the aisles. But then, it’s a well known fact that will power and I are not on speaking terms. I discovered this when I went next door to try on blouses and THE SIZE THAT USED TO FIT ME? Well, mysteriously, it is now made smaller than it ought to be. Which is just wrong. So, am I missing something at Big Lots? Did I just hit it on a bad day, or have y’all found some really great bargains? Nothing else ever caught my fancy. I don’t find a whole lot there, either, and now that I live somewhere where the one and only one is out of the way and inconvenient, I almost never go anymore. I occasionally find interesting food goods, but that’s about it. Never buy clothes there, they are CHEAP! Now, they do sometimes have a good selection of software at good prices, even name-brand stuff. I bought a lot of educational software there when the kids were little (Jump Start and the like). On occasion I will score something decent at Big Lots. We got a good microwave there for an okay price, and I have two decorative toy boxes that have lovely roses that were handpainted (by Chinese children, no doubt). I actually really like those toy boxes, and they were only like $35. But I do always feel kind of dirty after I shop there. I’ve never left out of there with a real deal either. I wander around, hoping for some kind of bodacious deal, and find nothing. Their prices aren’t any cheaper than WalMart, KMart or Dollar General. I’d say, false advertising. I have found Beth Moore Bible studies at Big Lots, the leader guides w/ dvds and student workbooks. I sometimes pick up cute seasonal holiday decorations too. It’s usually hit or miss. A long, looong time ago I used to find decent deals there. We grew up going to Big Lots (aka Pic N Save) with my mom. However, it’s been years since I scored anything great there. It’s probably been at least 5-6 years since I even went inside one of them. 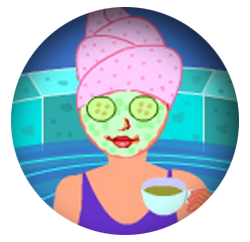 Good call on avoiding all the junk and the scary lotion! The little island though? That just might be worth going back for, especially if it’s a good fit for your kitchen. Finding pieces like that to actually work in our limited space is always exciting!! I’ve gotten lots of groceries at Big Lots. It’s usually things I wouldn’t buy otherwise (fruit snacks, packages of chips, diet bars etc). They ARE cheaper there and once they get on clearance they’re a steal. I would steer clear of the kitchen cart from BL. Their furniture is usually pretty shoddy and doesn’t have a reputation for standing up to much. I’m pretty sure Jensen would finish it off within a week. I’ve never found anything worth buying at Big Lots either. Going into to the store makes me feel icky even. Don’t know why – I love Dollar Tree. I wander into Big Lots occasionally but haven’t been in a long time. I do get book cases there. They hold up pretty well and are cheaper that Walmart or Target. I have found good yarn for $1/each. I will go to Big Lots of there is something I am looking for that I can’t find anywhere else. I often get irritated when looking at the toys because I KNOW they get them from Toys R Us when they can’t sell them and usually Big Lots jacks the price up past what the last price was at TRU. Like Goodwill, who gets the clearance stuff from Target–I laugh because I know what something cost at Target on clearance then I see it at Goodwill for 4 or 5 times more than that. Being Canadian, I have only experienced Big Lots once. I got a few things there, but not much…and that was a long time ago. It compared to our ‘Bi-Way’s up here…but they no longer exist. I am a fan of the cupboards on wheels for the kitchen…expecially one short on space. I have one I bought, for around $30 on sale, which is a microwave stand, but I use it to hold my stand mixer (which won’t fit on the counter because it is too tall to fit under the cupboards). The mixer on the stand can be wheeled over to the plug quite easily without having to lift it, and it stores my recycle bin underneath. It is a very handy solution. I guess, however, for $129 you’d want to make sure it was a sturdily built cabinet. I don’t go in Big Lots very often and I usually never buy anything when I do. But somebody told me they have scrapbooking stuff and sure enough! I went and got a huge pack of stuff for $2! It’s hit or miss, but it will be a ‘go to’ place to see what I can get on the cheap for scapbooking now. Who knew?! I’ve even ventured into the bathroom at Big Lots (trust me, I didn’t want to be there). 🙂 My finds are few but worth it to keep going every few months. The 100 calorie snacks, etc are cheaper there and a nice treat for my diabetic daughter. Sometimes I’ll find baby wipes at a good price. Best deals I’ve found – car seats, Diaper Champ, scrapbooking supplies and coloring books. I have never found anything of use at Big Lots other than little crap stuff to fill stockings or whatnots. But I gotta say, that little kitchen cart looks good for the price. Our children’s librarian finds a lot of stuff there for the summer reading program and other library events. It’s one of her favorite stops, but I haven’t found anything I wanted/needed for a great price yet. Makes me feel better to read that others haven’t either; I was beginning to think there was something wrong with my bargain shopping skill! Other than that… I’ve gotten some organic granola and cans of rotel… nothing exciting and nothing I couldn’t live without. Ours in in a scary area so I pretty much never go. My official comment is: “meh”. The Big Lots stores near us vary greatly in their selection and prices. One is near my place of work and has very nice deals on cleaning products, paper products and soft furnishings like rugs and curtains. The Big Lots closer to our home is not so great. I think it is a “hit or miss” situation. Also, watch the expiration dates on any food items. Never been to Bog Lots. BUT…check out Ikea for kitchen carts. They have TONS of choices! Big Lots: I’m a first grade teacher and I get TONS of storage items for my classroom there that are inexpensive and last well among 20 six-year olds. I also love the spring yard items like ceramic pots and small planters. I guess you’d have to be willing to shop there often (I’m not), but for the things I need, they come through. I have to agree with you, I have never had much luck at BigLots. I have way more fun at the dollar tree! !